Color(s): Deep red with buff markings along the muzzle and over the shoulders; dark sabling over the back, tail, and loins. Also referred to as the American Dingo, the Carolina Dog is truly primitive. They are thought to be direct descendants of ancient Pariah dogs that existed 8,000 years ago. Carolina Dog's are not of selective breeding and are difficult to obtain. The Carolina Dog is extremely muscular, powerful, and agile. They are hardy and possess an alert, intelligent expression. This is not a completely domesticated canine and is not recommended for inexperienced or first time owners. The Carolina Dog is suspicious and shy of strangers. They bond to their human "pack" and have a "pack" hierarchy. They do best with older, considerate children or with children they have been raised with. They may not tolerate strange children. Carolina Dog's typically do well with dogs, cats, or other household pets they have been raised with or properly introduced to. Occasional brushing with a firm bristle brush is recommended for the Carolina Dog breed. There are no known health issues associated with the Carolina Dog. 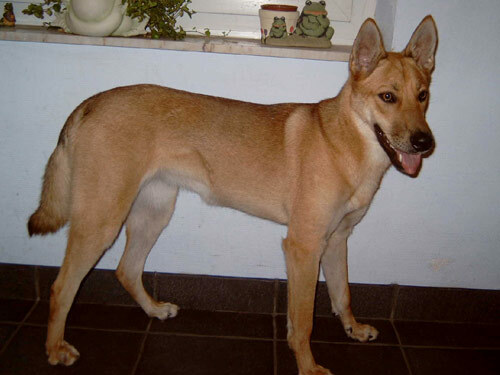 The coat of the Carolina Dog is the most distinctive feature with the appearance being affected by the seasons. The Winter coat is heavier and more dense than the Summer coat. The hair is short and smooth on the ears, head, and front legs. There are longer, coarse guard hairs over the neck, back, and withers. The Carolina Dog must have a clear leader who exhibits respect. Early, intense, and ongoing socialization and obedience are crucial. They will not respond to harsh or heavy-handed methods. Training must be done with respect, reward, firmness, fairness, patience, and consistency. The Carolina Dog is not suited for apartment or city living. They do best in a rural setting with a large yard to romp and run. Yards must be securely enclosed. Fencing must be buried into the ground to prevent escape through digging and capped at the top to prevent climbing over.